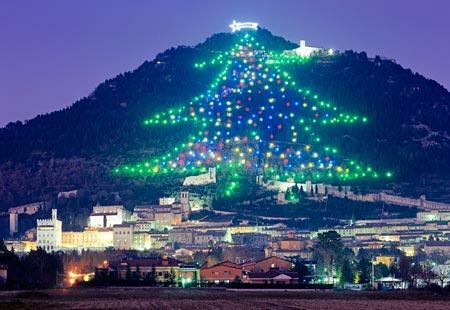 The tree is 650 metres (2,130 ft) high and 350 m wide at its base and consists of 3000 multi-colored lights and 8.5 kilometres of electrical cable, placed all the way up the slopes of Monte Ingino, which towers above the city. The illumination can be seen up to 50 kilometres 30 miles away. This tradition started when people of Gubbio decided to celebrate Christmas in a different way and in 1981 the first tree was illuminated. Each year, on the eve of the feast of the Immaculate Conception (December 7), the Christmas tree is lit up. Since then the tradition is repeated annually thanks to a special committee consisting of volunteers giving up their free time for about three months every year. Since 2010 electricity for the Christmas tree lights is generated by the photovoltaic system. In 2011 the lights were switched on remotely by Pope Benedict XVI using a tablet computer. The Pope spoke via video link to the people of Gubbio from his papal apartment in Vatican. In 2013, the holiday display used 1,000 lights and stretched more than 1,000 square meters or 10,760 square feet. In 2013, Don Francesco Soddu, Director of Italian CARITAS led the lighting ceremony. This was a tribute to the contribution of volunteers in times of emergencies in Italian communities.